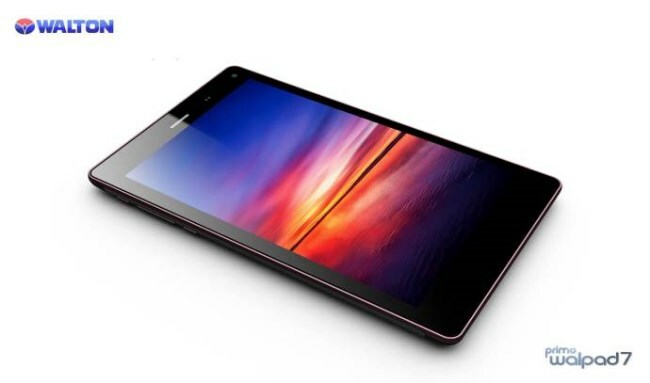 Walton Primo Walpad 7 Specifications And Price In Bangladesh. Walton has already proved itself as a reliable smartphone. Walton has gifted us number of highly modern technology based smart phone like- Primo X2, NX, H2, H1, G3, G2, X1, N1 in an affordable limit. Now Walton is going to flash their first Tablet named Walton Primo Walpad 7. This tablet a unique one for its configuration, performance, cheap price and longevity in comparison to that of same other products. Walton Primo Walpad 7 is configured with 7” display, 4.2 jelly bean OS, 1GB Ram, 28nm Quad-Core 1.2GHz processor & 5.0 Mega pixels cmera. Motion sensors: All in one Sensor with LE Technology. This entry was posted in Mobile Phone and tagged Walton Primo Tab 7, Walton Primo Tablet 7, Walton Primo Tablet 7 Price, Walton Primo Walpad 7, Walton Primo Walpad 7 Features, Walton Primo Walpad 7 Market Price, Walton Primo Walpad 7 Price, Walton Primo Walpad 7 Price In Bangladesh, Walton Primo Walpad 7 Price In BDT, Walton Primo Walpad 7 Review, Walton Primo Walpad 7 Specifications, Walton Tab, Walton Tablet by Result Gov BD. Bookmark the permalink. Tablet kinar icchok onek din age teke but kintesina ‘WALTON TABLET’er jonno opekkai chilam. Amader bangladesh. Amader walton. ami anekdin dhore apekha “”””””Laste bhablam Qurbani EID er age Walpad 7 aboshai asbe kintu!!!!!!!!!!?????? ?